As the government shutdown wears on, I’m becoming more concerned about my students and friends who are missing paychecks from their government jobs, and soon, many other students, friends, and family members who use EBT will find that many grocery stores will stop accepting food stamps due to as many as 2500 retailers failing to renew their EBT licenses before the shutdown took effect. Are we prepared for a world without access to store-bought groceries? If you simply don’t have the money for groceries, where will you get food for yourself and your family? I have friends who don’t mind digging down under the snow to find a few Round Up-soaked potatoes that the potato harvester missed. I have friends who will collect dried feed corn from farmer’s ethanol fields and grind it in to cornmeal. I have even helped friends get perfectly good food out of dumpsters behind grocery stores and restaurants. In fact, one of the few times I have eaten lobster was when my friend, a chef, collected six LIVE lobsters out of a dumpster in Minneapolis, and boiled them up with gorgeous organic corn on the cob and new potatoes. Delicious and free. But what if you find yourself broke and hungry in the winter months, and you just don’t feel safe dumpster diving or collecting the leftovers from Monsanto’s corn, soy, wheat, and potato fields? It isn’t selfish or wrong to want healthy food…even when you don’t have the money to purchase it. 2. Rosehips (Rosa spp) are still chock full of Vitamin C and, if you feel like removing all the sticky seed hairs, the seeds have tons of Omega 3 Fatty Acids. Otherwise, remove the seeds and make rosehip tea or muffins. If you have access to Hawthorn berries (Crataegus spp), you can use them just like rose hips and you don’t have to worry about the hairs! 3. Acorns (Quercus spp), Walnuts (Juglans nigra), Butternuts (Juglans cinerea), Hickory nuts (Carya spp), or any edible tree nut…I don’t even look for the worms this time of year. Extra protein, right? All of these nuts are rich sources of fat and protein. Maple seeds (Acer spp) and elm seeds (Ulmus spp) are also edible, but a lot more labor intensive. 4. Cattail (Typha spp) roots are fairly simple to get, even after the ground has frozen. Grind them in to flour or chop them up in to a stew. 5. Pine (Pinus spp), spruce (Picea spp), and fir (Abies spp) needles make nutritious, delicious tea that is also useful in treating coughs, colds, congestion, and sore throats. 6. Juniper (Juniperus spp) berries pair beautifully with wild game as a rub or sauce, and they contain healthy sugars and flavonoids. 7. 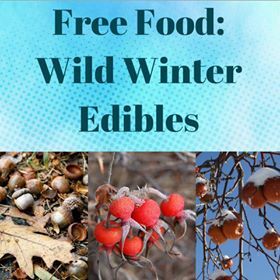 Wild greens such as dandelion (Taraxacum officinale), chickweed (Stellaria media), wild and cultivated mints (Lamiaceae), nettles (Urtica dioica), violet leaves (Viola spp), and dock (Rumex spp) are often still green and a nutritious under the snow…even in harsh prairie climates. If you live near the ocean or in a more temperate climate than the Northern Great Plains, I’m jealous, because you have a multitude of other wild edibles from which you can choose including seaweeds. Also, I didn’t discuss wild mushrooms because identification can be unreliable during the winter months, but if you have an excellent and sustainable source of chaga (Inonotus obliquus), it is highly nutritious as a tea or powdered as an additive to soups and smoothies. All of the above plants can be paired with wild game, fish, shellfish, or other meats. So, if you fish, hunt, or trap, you can prepare beautiful, healthy and even medicinal meals for your family…for free. If you know someone who is struggling and doesn’t have the knowledge to hunt or gather wild foods, do it for them. After all…we are all in this together. Linda Black Elk Linda (Catawba Nation) is an ethnobotanist specializing in teaching about culturally important plants and their uses as food and medicine. Linda works to protect food sovereignty, traditional plant knowledge, and environmental quality as an extension of the fight against hydraulic fracturing and the fossil fuels industry. 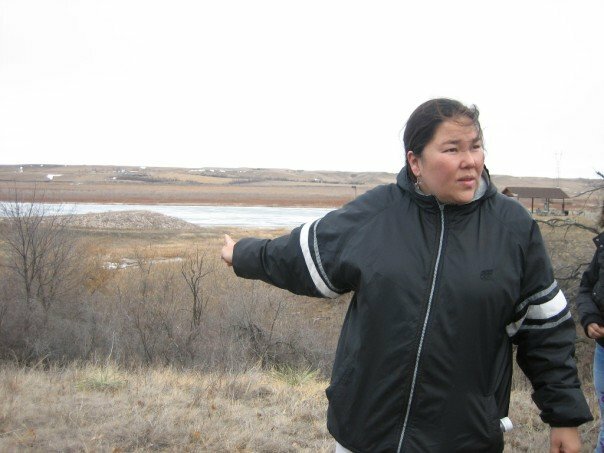 She has written for numerous publications, and is the author of “Watoto Unyutapi”, a field guide to edible wild plants of the Dakota people. This entry was posted in education, Healthy Lifestyle and tagged food, Last Real Indians, Linda Black Elk, LRInspire, wild edibles, winter by lrinspire. Bookmark the permalink.